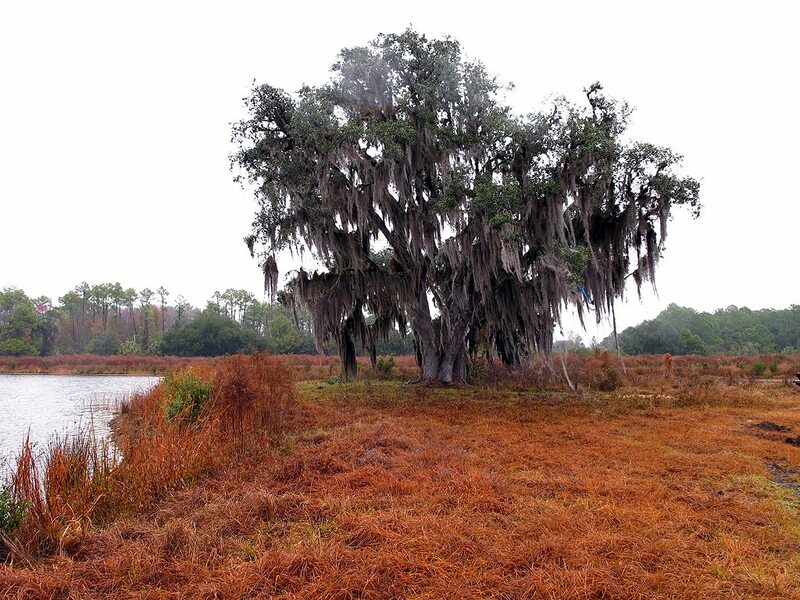 This preserve consists of 1,126 acres. 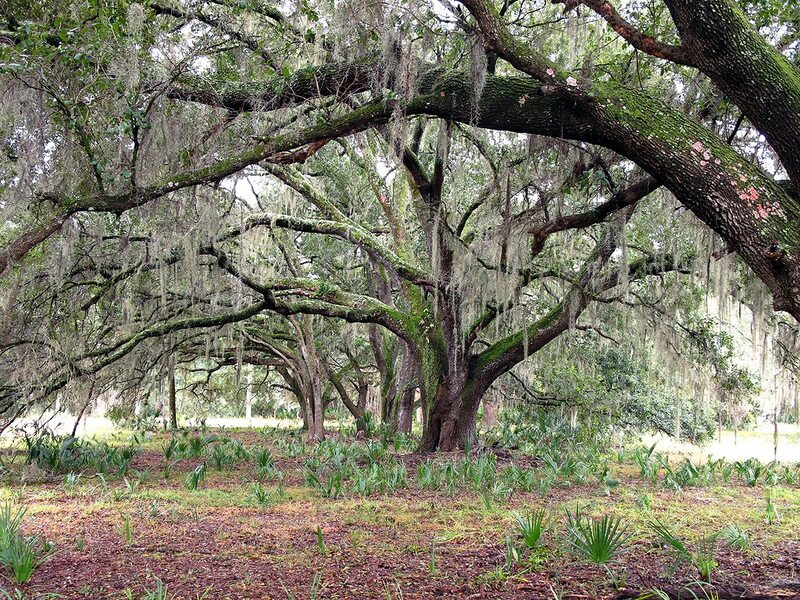 Comprised of a few ecosystems, hikers have the opportunity to experience dry sharp palmetto scrub land, the artistic patterns of the wetlands and the majestic tranquility of oak hammocks. 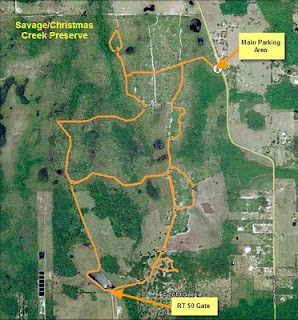 There are a number of blazed trails located throughout the preserve. The trails [just old roads] in most cases, have a history all of their own weaving throughout the area. Be prepared to give the calves on your legs a work out, as there are some areas of deep sand which must be hiked through. I hiked most of the trails on a very wet day; the sand having been matted down by the rain was appreciatively a little more bearable. 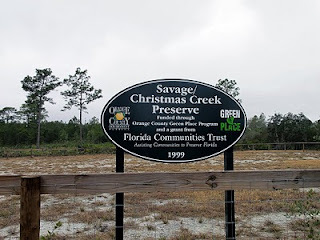 All of the trails are in the open, so I’m sure that it could be quite brutal hiking this area in hot weather under the direct Florida sun. It is just about impossible to get lost while hiking the preserve. Dogs and bikes are not allowed in the area, but Certified Trail Equestrians may use the trails to exercise their horses. The preserve seems to be made up of two major sections, one just scrub while the other an old, long deserted farm. I personally, like to explore old farms, so I dwelled for a significant amount of time in that area. Remnants of the old farm as old posts, gates, barbed wire, and feeding stations have been left behind for future generations to discover as they venture into that section. The county has provided a metal bench on one section of the trail and a metal picnic table in another section. Both are pretty chained down, leaving me to surmise they have already been replaced. Whether from a storm or human acquisition, I guess nothing is safe. I always try to remember a small plastic shopping bag to pick up after those who leave their mark by littering an area. I promote the motto, “take nothing but photos and leave nothing but footprints”. The Blazed hiking trails start right out of the parking lot. The northern section of the preserve is mainly just roads, with a lot of sandy spots which wind through palmetto scrubs. There are a few pine tree groves as well as some small groves of shorter trees native to the area. There are a couple of blue trails which branch off the main trails. The blue trails are actual trails which run through the scrubs. 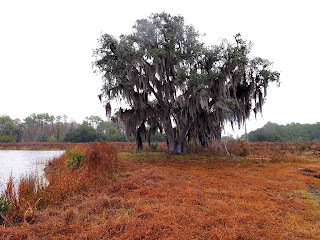 In one section you will come across a fenced section which has a small cypress tree area. You can see a large tower off in the distance. Upon following the trail south you will come to what is left of an old wooden fence. This marks the old property line between the farm and the scrubs. I noticed a number of items right near the trail which reflected the farm usage of the past. There is an old concrete cattle feeder/waterier and a small structure which was used to feed nutriments to the cattle. Within the oak tree area you might spot a single concrete slab which almost looks like an old grave marker. Hiking further south you will encounter a beautiful oak tree next to what I assume is a manmade pond. I looped back and headed north to catch one of the trails I had hiked earlier in the day. From there I headed out and back to the parking lot. My total distance was 8.75 miles. It was a little hard on my feet and legs because of the deep sand in some spots. The day I elected to do the hike it turned out to be a very wet, misty day. That certainly made the hike a little more difficult. I hope to get back to enjoy the area on a dry day, before the mercury rises. Currently access from RT50 is marked “no trespassing”, so getting in from there might get you in trouble. I notice that the county has stated that they are contemplating building a small park down in that area.